These photos (used with permission) were taken by "amateur" (believe it or not) photographer Dave Kinneer of VA. He used a Canon EOS 1D Mark II N and a Canon EF 300 mm f/2.8L IS lens. See his photo galleries for larger versions and more action shots. We often think of Bluebirds as gentle birds, but many will actively defend their nest site. Unfortunately, sometimes they can not compete. They often lose out to House Sparrows and House Wrens. If the entrance to a nest site is enlarged, they will also often lose to Starlings. They are also territorial, and will fight with other Bluebirds and Tree Swallows. Some bluebirds are more aggressive than other - this is probably hereditary (selected for over time.) (BNA) However, more aggressive males may spend so much time defending their territory that it impacts breeding, as they have less time to tend to their mate during incubation. This means the female has to leave the nest more often to feed herself (exposing eggs to predation, or resulting in more variation in incubation temperature), so less young may fledge. Also see: Predator Identification and Solutions, Competition Among Cavity Nesters, and an essay on the Downside of Bluebirding. 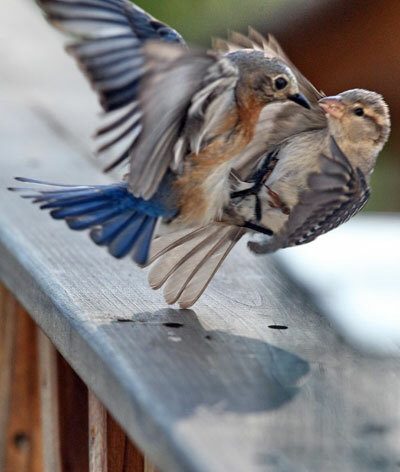 A female bluebird fights off a female House Sparrow (HOSP) that had been checking out its nestbox. 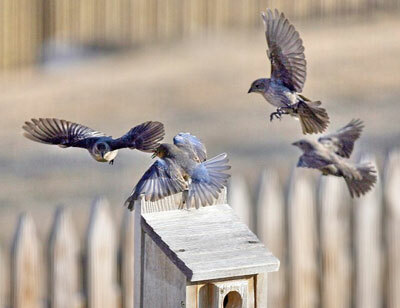 Any nestbox that a bluebird can enter can be entered by a House Sparrow, since they are smaller. House Sparrows will peck and remove eggs and nestlings. If they trap an adult inside a nestbox, they may decapitate it, and then proceed to build their own nest on top of the corpse. House Sparrows are non-native (introduced) birds. Under U.S. federal law, nests and eggs may be removed, and young and adults maybe humanely euthanized. There are also a number of passive methods that can be used to manage House Sparrow competition - see House Sparrow Management for more information. Sparrow Spookers are particularly effective once the first bluebird egg has been laid. Traps can also make a big difference. Also see HOSP photos and reports of attacks (and graphic photos) of HOSP victims, and a video of a HOSP that caught another bird inside a nestbox. 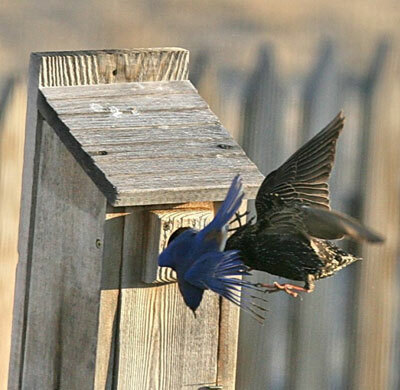 Successful bluebird and Purple Martin landlords do not tolerate HOSP. It is better to have no nestbox at all than to allow HOSP to breed in one. 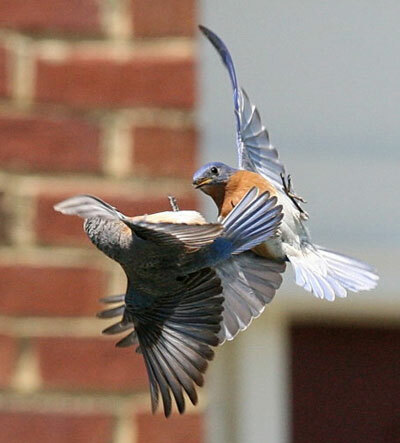 A Male Bluebird fights off a Starling. This bird may be a juvenile, as the tail looks short. Starlings can not enter a 1.5" hole, but if the hole is enlarged they can gain access. A hole restrictor can prevent this. Some people have had Starlings get into Peterson boxes. 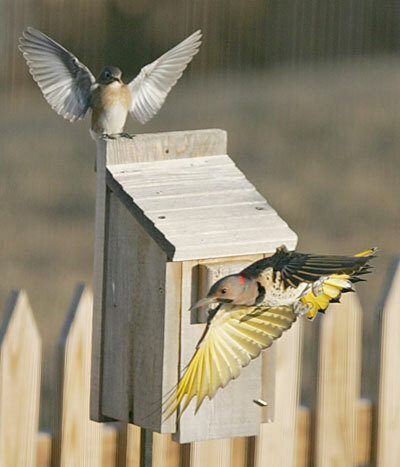 Starlings may also reach inside a box and steal eggs or nestlings. 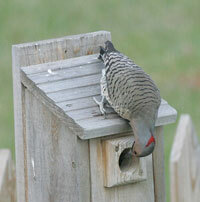 A 1.5 to 2.25" thick wooden block over the hole can make it harder for avian predators to reach inside. See more tips. Three female cowbirds were harassing the bluebirds by this box for several days. They would land on the fence and the grass, edging closer and closer, then eventually landing on the nestbox and peeking inside. Cowbirds are native, but they are parasites. They do not build their own nests. Instead they remove an egg belonging to the host bird, and lay one of their own (white with brown spots) in its place. The cowbird baby hatches first, opens its eyes first, and usually gets the lions' share of the food. In many cases, the host's own nestlings die. See more information about Cowbirds. This Flicker had been looking inside the box (see below). The female Bluebird strikes a vampire pose. (Keith Kridler said it looked more like an angel pose!) My husband thought this photo was fake. See more info on deterring avian predators. 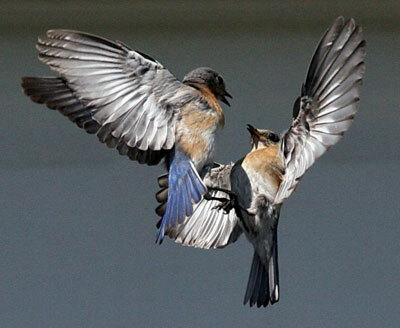 A male and a female Bluebird duking it out. She was wing waving, trying to get his attention. He retreated and then finally attacked her. There were at least a dozen female bluebirds within 100 feet at the time, and far fewer males. The females were competing for the attention of the males. He may have eventually accepted her as a mate after his original mate disappeared. At the time, he had four 4-day old nestlings from a second brood. But then the new mate apparently proceeded to get rid of the prior mates' young. Dave found two nestlings dead in the nestbox, and another in the grass 20 feet from the box. He returned the baby to the nest, but the pair refused to feed it, and it disappeared overnight. They now have three young of their own. They have also driven off the fledglings from the first brood. Bluebirds have been seen removing eggs and nestlings from boxes, but this is not a common occurrence. Two female Bluebirds fighting with each other, perhaps over the male above (same time frame.) They carried on for at last a half an hour. There was a lot of wing waving and chatter in addition to this fight. If boxes are too close to each other (less than 100 yards for Eastern, 200-300 yards for Mountain Bluebirds, and 100-300 yards for Western Bluebirds), battles with competing bluebirds may ensue. Males may grab their opponent's legs, causing both combatants to fall to the ground. Once on the ground, the aggressor may pin the intruder on his back by standing on him, spreading his wings wide and then vigorously jab his opponent with his bill. 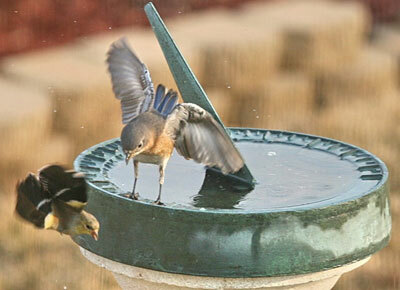 American Goldfinches pose no threat to bluebirds, but apparently this female bluebird wanted a solitary bath. Actually both Goldfinches and House Finches may hang out with Bluebirds. Some folks call them "bluebird wannabe's." Bluebirds have been known to attack Robins, House Sparrows, Brown-headed Cowbirds, Brown-headed Nuthatches, Blue Jays, Northern Mockingbirds, Great Crested Flycatchers, Starlings, Carolina Chickadees, Tree Swallows, etc. over food or nest sites (BNA). Some anecdotal reports of attacks on squirrels or chipmunks. Bluebirds captured by humans will try to bite if they get a chance. And a second cousin to a paranoid nerd.